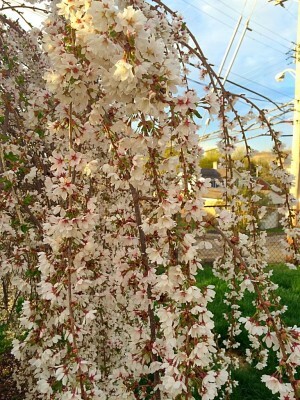 Small to medium trees which produce massive, beautiful blooms. Generally pest and disease free. Water deeply and infrequently. Accolade - Small tree with spreading, horizontal branches. Grows in height from 15' to 20'. 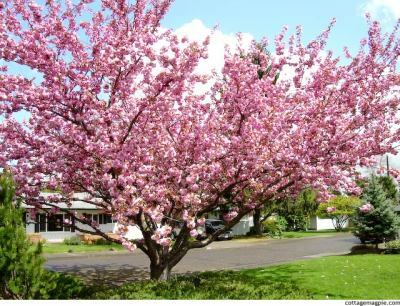 Flower is semi-double pink bloom which hangs in small, drooping clusters. Akebono - Dense, rounded head with a spreading form. Grows in height from 20' to 25' with an equal spread. Blooms in early spring before leaves appear. 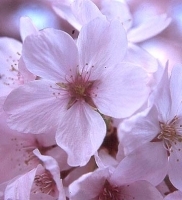 Flower is a single, pale pink bloom (image)​. Amanagowa - Grows in columnar shape. Grows in height from 15' to 25' with a spread of 4' to 5'. Bark is gray in color. Leaves are yellowish-green. Flower is a semi-double, light pink with deeper pink margins. Mt. Fuji (P. serrulata "Shirotae") - To 20'. Semi-double pinkish bud, white when fully opened. Purplish-pink as flower ages. Early ​(image)​. Sargent - Hardy, upright tree with rounded top. Grows in height from 40' to 60'. Leaves turn to a beautiful brilliant orange-red in fall. Flower is a single, pale pink. Serrula (Birch Bark P. serrula) - To 30' with equal spread. Beautiful bark with mahogany red color. Small white flowers in mid-season. Shirofugen (P. serrulata "Shirofugen") - To 25'. Double, long-stalked, pink flowers fading to white. Taiwan - Graceful, upright, slender tree. Performs well in southern California. Single, electric purple-pink flowers. Whitcombi (P. subhirtella "Whitcombii") - To 20' to 25'. Buds almost red opening to pink, single flowers. Very early, profuse bloom. Yoshino (P. yedoensis) - Fast growing to 40'. Graceful, curving growth. Single, white-pink to nearly white, fragrant, early flowers ​(image)​. A really outstanding garden choice. excellent in containers (image). Double Subhirtella - A small tree with graceful, weeping branches. Grows in height from 15' to 18'. Flowers are double, rose-pink. 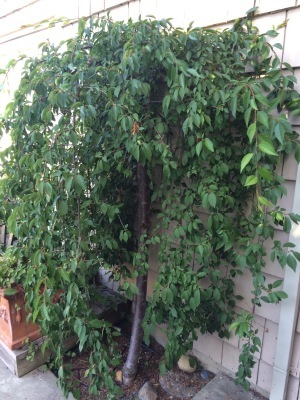 This is the most popular of all weeping cherries. Snow Fountains (P. pendula) - Tree has graceful, weeping branches. Grows in height from 15' to 18'. 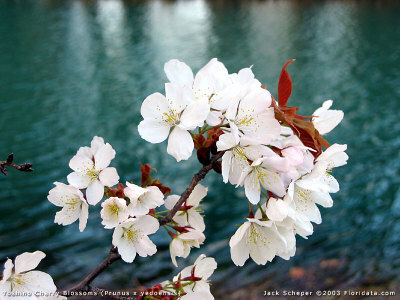 Flowers are single and white in color. The hardiest, easiest to grow of the wepping varieties ​(image)​.